Sometimes I wonder if my friends are really paying attention to me when I talk or just doing something crazy on their computers as they listen. Today when I received the e-mail below I realized, I am lucky enough to have some friends who gets me and listens, especially when I talked about my thesis in a recent conversation. This is an example of a good use of technology. I don’t think I would ever pick up a GQ magazine ‘just because’ so without my friend Matt, I would never have read this article that is so relevant to my thesis ideas. This is where technology does us good–with the help of copy & paste and e-mail at the touch of our fingers, Matt could send me the articles instantly. He didn’t have to write me a letter or call me to tell me about it, but I got it! I didn’t have to buy the magazine to read it, but I could just get linked to it…amazing! The article is the letter from the editor, Jim Nelson, titled, I Love the Way You Hold Your Gadget (GQ, October 2012). The editor jokingly talks about how he was on a hike in California and wished he had his iPhone with him to experience the view. Funny right? But so true. Some people can’t live, and laugh at the idea of not having a cellphone. He goes on to talk about how everyone is on their phones in the city, looking down not up at where they are going. 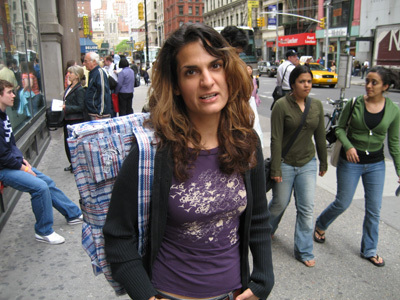 We are all guilty of it–checking our phones as we walk and not paying attention to the things around us. I know I am. This got me thinking back to my conversation with Dr. Levinson about how the use of technology is an evolutionary process. I think it’s already clear that technology is not going anywhere and it is how we use it that we need to think about. Find our own balance as all this new information comes our way. What was even more intriguing to me was what Nelson had to say about online dating that shows how technology is already evolving itself. He said that he read an article in the Times about how online dating can only take you so far because these online dating sites realized that “algorithms will only take you so far, and that the best way to find a potential mate is in person.” So already, the technology is finding flaws in itself. Clearly an algorithm can’t solve everyone’s problems and we still need to find that balance. So to tend this little thought trail, (which I am not sure made any sense now that I look back at it) here are the final paragraphs from the article. Who thought that meeting someone in person would be called retro. We can’t rely on technology for everything, but as Dr. Levinson pointed out to me in our interview, it’s a learned behavior that we will figure out, eventually. Media archaeology brings together the old and the new. Studying old media to understand the new media, and how they overlap one another. Just because there is something new, doesn’t mean the old gets replaced…it’s just another layer to what we already have. More of my reading notes help me figure out what exactly media technology is, and how it is related to my thesis themes. I am definitely not a tweeter, but I do have a Twitter. I was reading through this morning and stumbled this quote tweet by John Maeda, president of Rhode Island School of Design and one of the big “STEM to STEAM” leaders. 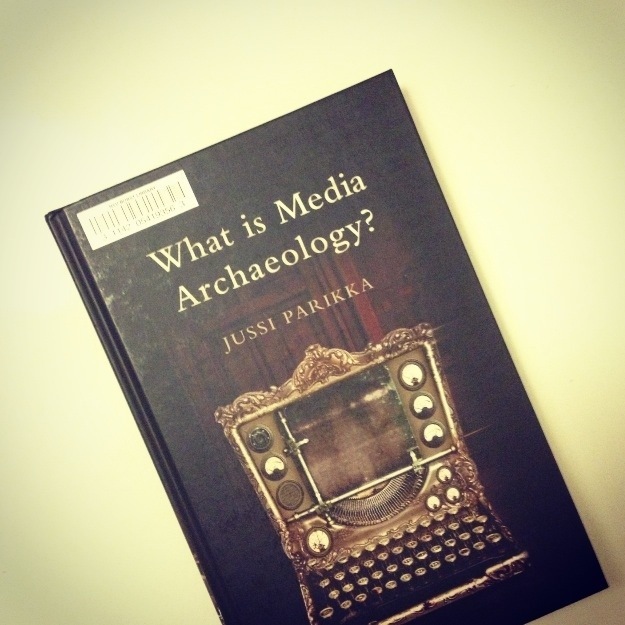 I started getting into my “What is Media Archaeology?” book by Jussi Parikka and one thing I did pick up so far is media archaeology is a parallel between the old tech and the new tech. We need to study the old to understand the present. Went to the NYU library and picked up this book along with a couple others. I am looking forward to reading more about this topic and even more excited that I was the first person to ever borrow this book! Ever! That’s a nerd thing to be excited about but what can I say, I am kinda a nerd sometimes. This project draws attention to the separation created between a person and society when they are walking on the street and talking on their cellphone. 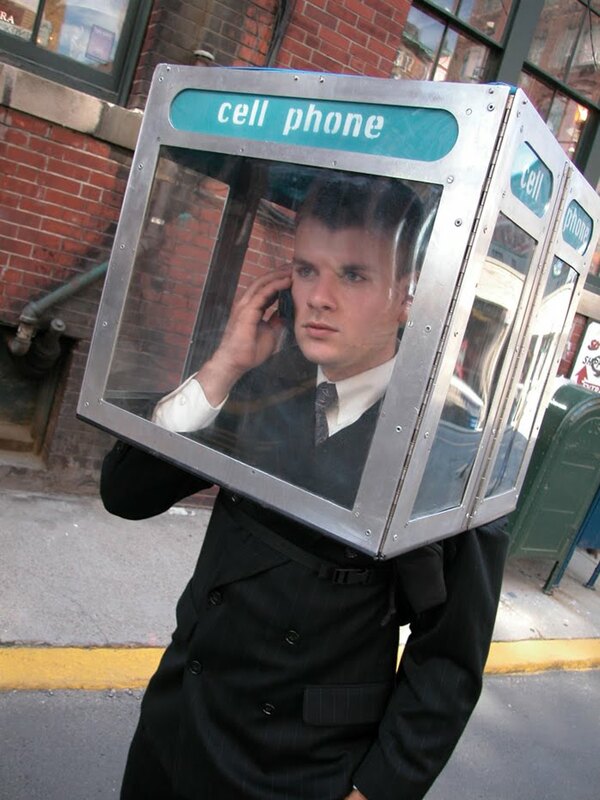 By creating a portable cellphone backpack, the user can wear it around and when on a call, pull the booth over their head. 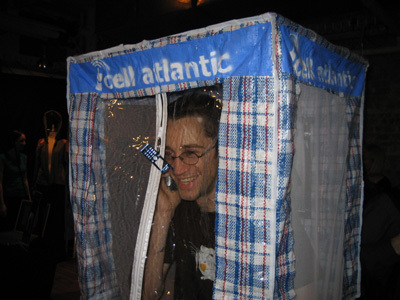 The booth represents the isolation and privacy of a phone booth. Imagine if everyone on their phone had this on their back. It’s becoming too easy for people to pull out a cellphone and use it and people are becoming unaware of the isolating effects they have on others. 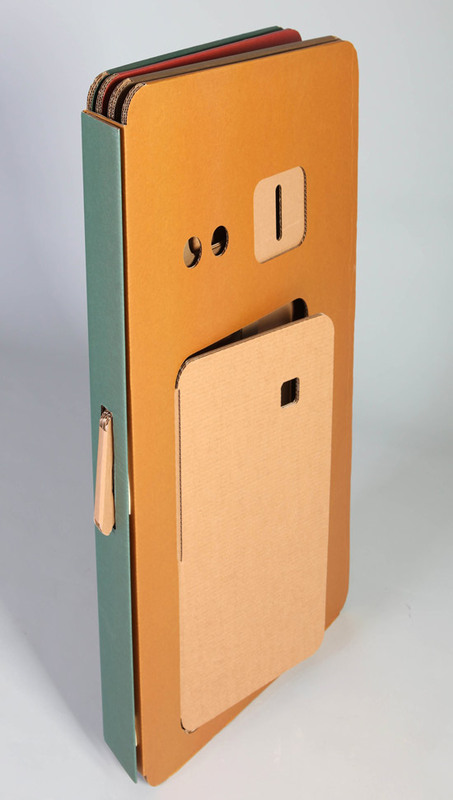 This is related to my idea of where the phone fits into the physical space. If I am trying to get at the etiquette of cellphone use, this helps to show the separation. Although I think I wil create something physical, I don’t think it will be as radical? This is an interesting comment on how the phone has intruded or impacted our life and how we take for granted the ease of use. This project puts a new use for the cellphone which I am not trying to do. I like how it raises and awareness to the user and has different forms to address the same issue. This project brings attention to the connection between privacy and courtesy. Using a phone is now so easy for us to do since we are not glued to a desk or next to a phone booth. We use our phone all the time, anywhere, answer at the very moment it rings because it is right next to us. However, people often disregard those around them. Not everyone needs to hear your conversation. The artist “grappled with these issues of privacy, personal space and nostalgia for a ‘simpler time.”‘ Something that I am also trying to get at with my current thesis idea. Another phone booth backpack! This one might be better than the one above because the user is fully enclosed by the backpack. I am thinking that in whatever way I choose to impose my thesis ideas to my users/viewers, they will not engage with using the cellphone or whatever technology it is. After all, the point is to find a balance and etiquette not engage the user/viewer in the problem. Unless, they might need to in order to provide a full experience. Just a quick thought on my (big) domains right now. Prototype 1: A “new” dinner? Family dinner becomes identified by certain criteria that becomes universal across families around the world. Dinner usually happens around a table, with other members with place settings and a good meal. 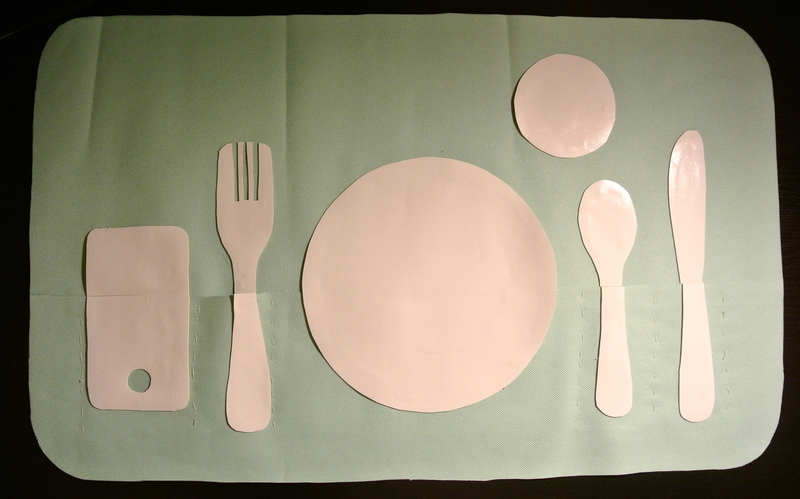 A place setting is a universal symbol for eating, and a formal recollection to the dinner table. Creating this place mat and presenting it to a few viewers I was able to get feedback on their personal reactions and feelings of seeing the mobile phone as a part of the dinner table. 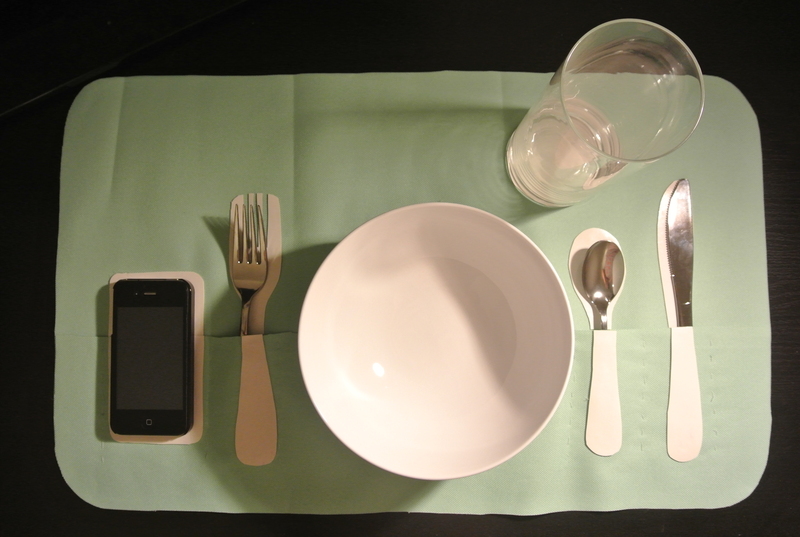 No longer is it just about the plate, knife, fork, and spoon, but also the additional digital element. Interestingly, reactions ranged from “this is okay” to “this is seems so wrong” illustrating the changing acceptance by our generation. I gathered some feedback through sending photos via e-mail or placing this in front of people. It is interesting to see how the formal place mat has been “updated” to blend with society today. What is funny is that a major comment was “this would never happen with my parents” but it would be okay with friends. Although, just because your friends are young, it doesn’t mean this is any better, does it? Are we turning into a society that doesn’t mind disruption by cellphones? What would our ancestors think about that? How is this a commentary of how technology and digital devices affect our physical space? Attached is my presentation and here is a link to my prototype brief. Books, of course, cannot go very far without hands to turn their pages and eyes awake enough to read them. And we need to keep its pages close to our face. But books have the advantage of being readable anywhere there is light. No current electronic communication device has the book’s–especially the paperback’s– almost effortless mobility, requiring no preparation (other than being literate and having the book at hand) to receive its information. These quotes also sparked a memory of a book my mom showed me last summer. It was a good book titled “It’s a Book” by Lane Smith. The short video below describes the frustration between one character that wants more from the book. The following video shows that children may never look at books the same way. The baby, only one and already programmed to think of every surface as interactive, like an iPad shows how the technology we are so used to may cause new problems while solving old ones. 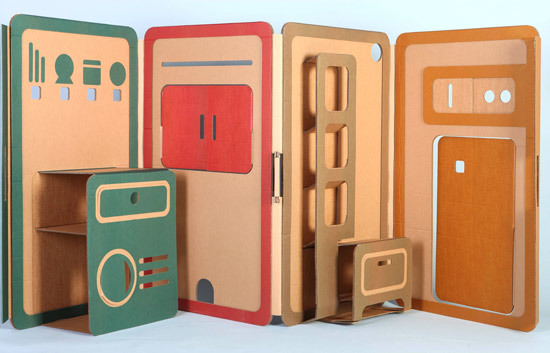 This is a “pop-up” play set by Liya Mairson. I have always been amazed and intrigued by anything “pop-up.” Pop-up books, cards, etc. I came across this and liked how it was something that could be easily transported when folded up. In a discussion I had with Paweena we talked about what if instead of having a pop-up playset, it was a “pop-up dinner table.” Something that would be able to move in different locations. Maybe into different homes or public space? Who would join in on the conversation?